Since 1973 parents have joined together in different cities to support each other and their lesbian, gay, bisexual and transgendered (LGBT) children or family members. 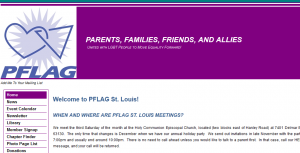 We meet the third Saturday of the month at the Holy Communion Episcopal Church, located (two blocks east of Hanley Road) at 7401 Delmar Boulevard, University City, Missouri 63130. We begin our meetings at 7:00 pm and usually end around 10:00 pm.